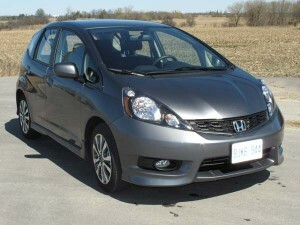 While marketed as the Jazz worldwide, Honda chose the model name “Fit” for its North American launch in 2006. The Jazz was a worldwide success with many different versions sold Worldwide. Perhaps the most intriguing were the four-wheel-drive units sold in Japan. The Fit is not your average stripped out econo-box. Mechanically the vehicle is fitted with a 117 horsepower 1.5 litre four cylinder i-Vtec engine with an electronic drive-by-wire throttle. Back in 2006 that was a significant upgrade over most cars in the marketplace, even today most vehicles still use a mechanical linkage for the throttle. A five speed manual transmission driving the front wheels is the default on all models while a five speed automatic is avialble as an option. All Fit models since the 2009 redesign feature Vechicle Stability Assist with traction control as well as Anti-Lock-Brakes with electronic brake distribution. The Fit sheetmetal features a low hoodline that angles upward to the large raked windshield. Behind the large sheet of glass is essentially a rectangular box with doors. The Fit looks more attractive than it sounds. The clean tapered styling sets it apart from other competitors in the marketplace. It’s a purely functional design with no gimmicky bits tacked on. 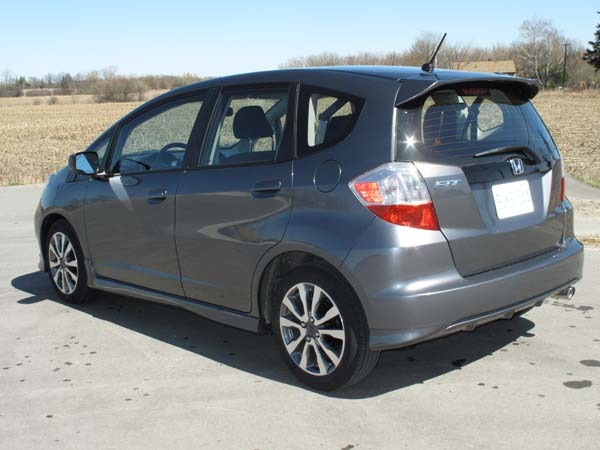 Whilst seemingly compact on the outside, the Fit actually has a longer wheelbase and weighs more than the original Honda Accord. Inside efficiency appears to have been the mantra guiding the layout and design. The standard rear “Magic Seat” configuration allows for creative storage options with its split 60/40 folding seats. 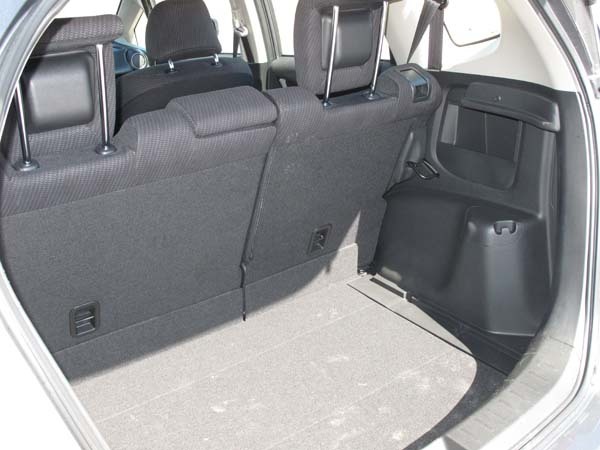 The rear seat backs fold forward boosting cargo storage from 20.6 cubic feet to 57.28 cu.ft. of flat floored storage. The front passenger seatback can also fold fully forward to accommodate a 2.4 metre long load. 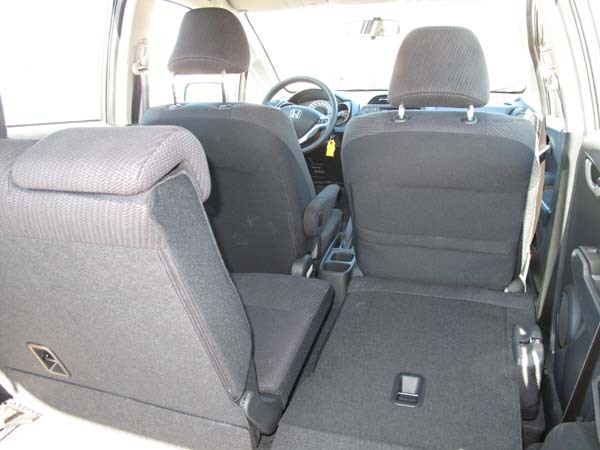 The rear seat cushions can flip up to provide full floor to ceiling cartage for taller items. Credit this ability to the fuel tank being moved from the rear half of the vehicle to under the drivers seat, an area less prone to impact. Passenger comfort is another strong point for Fit. From the drivers seat, the cabin feels bright and airy. Headroom is astonishingly generous six footers will find many iches to spare before rubbing the roofliner. The only complaint here was the feeling of how close the door is once seated. The Fit cabin has been reworked for 2012. The dashboard is now a uniform black colour as opposed to having silver inserts on earlier models. The two cup holders in the lower centre console are now deeper yet easier to get beverages in and out of. There are a total of ten drink holders throughout the vehicle. 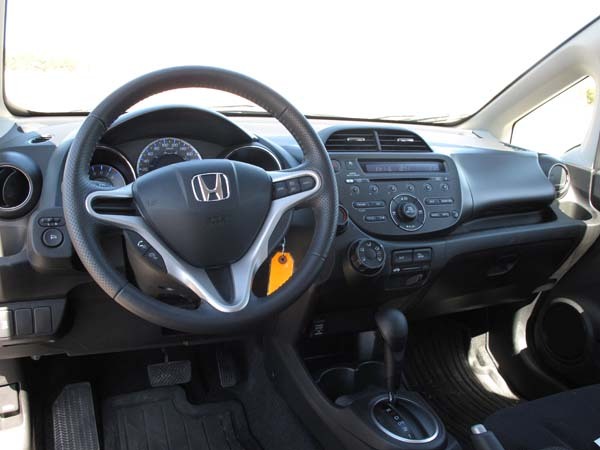 Depending on trim level, the cabin furnishing and exterior fittings vary somewhat. 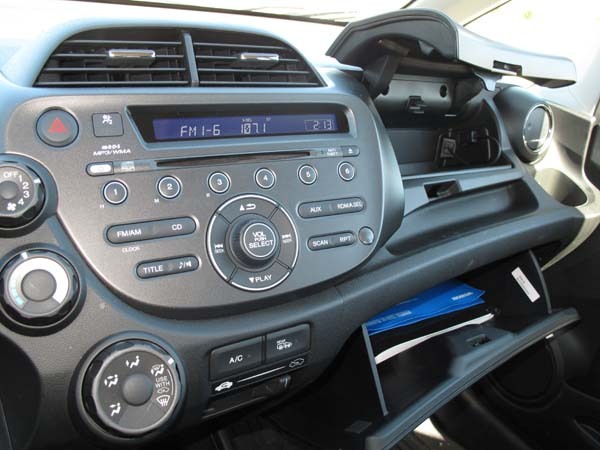 The base model DX comes with power windows (auto up/down), power mirrors, 15 inch steel wheels with covers and a 160 watt AM/FM/CD/MP3 audio system with an aux input and 2 speakers. An automatic transmission option comes from the factory with air-conditioning installed as a separate DX-A model. The LX model adds 2 more speakers to the the audio system, a driver’s side armrest, rear spoiler, cruise control, power door locks, Bluetooth Handsfree telephone link, heated colour matching mirrors and standard air-conditionning. Stepping up to the Sport adds a rear stabilzer bar for crisper handling, two more speakers (six in total), a USB audio interface, premium upholstery, 16-inch alloy wheels and aggressively styled body skirting. The vehicle tested was a Sport model with automatic transmission. 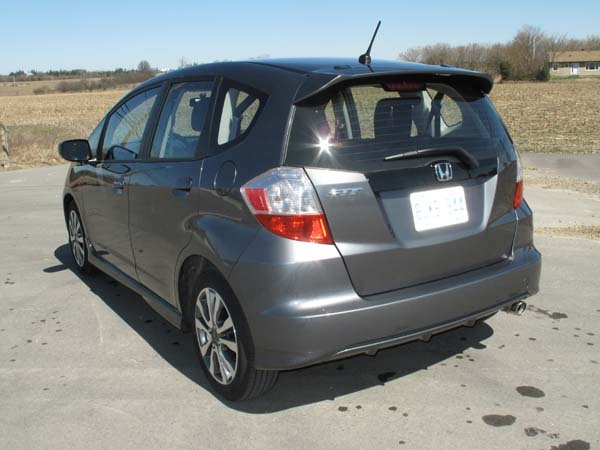 The Fit is a nimble package around town. Zero to 100 kms/hr comes up in 10.5 seconds, not blistering but peppy all the same. The electric steering feel is precise and the car has that “fun to drive” factor that makes driving less of a chore. While I typically prefer manual gearboxes, the automatic shifted smoothly and downshifted easily when extra zip was needed. The automatic model actually returns slightly better fuel economy, 6.3 litres per 100 kilometres combined, versus the manual gearbox rate of 6.5 l/100 kms. Road noise has been reduced thanks to extra sound insulation, making the Fit a pleasant highway ride. Stomp on the throttle however and the Fit’s engine rewards with a great mechanical rasp, a signature of Honda’s V’tec engines. Although besting most compact cars and crossovers with more cargo functionality, sales of the Fit have been dropping over the last few years. Blame increased competition from Honda’s own Civic (best selling car in Canada for 14 years) as well as domestic and Korean products. Our tester weighed in at $20,080, a price that many buyers rationalized by cherishing the “made in Japan” label. Following the Japanese Tsunami, Canadian market Fits are now sourced from the assembly plant in Shenzen, China. Jazz units sold outside of Japan and North America had been supplied from this plant for years. In all honesty if not told about the change I would not have known. 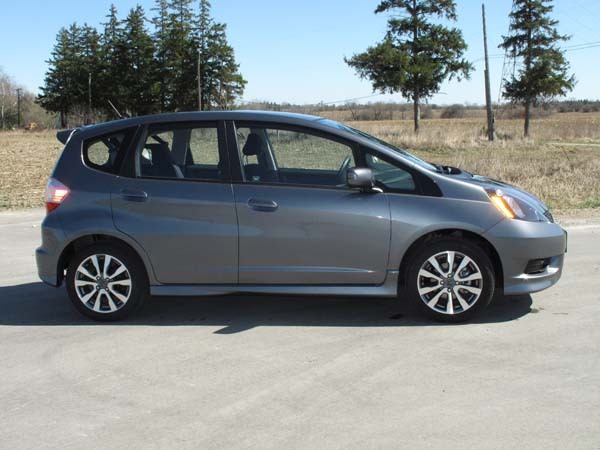 That being said, rumour has it production for all North American Fit models will be transfered to a new Honda plant opening in Mexico in the coming years.